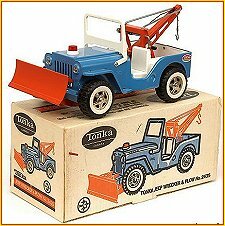 Tonka packaging can add 25% to 50% or more to the value of a truck sold without its box. 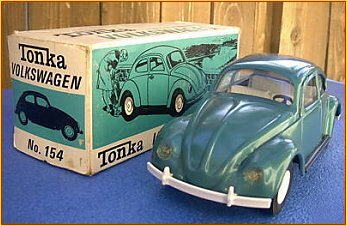 To maximize the value, the box must be in near mint to mint condition. Collectors pay big bucks for pristine packaging. 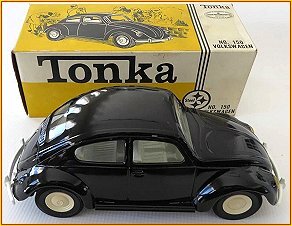 New in 1966, the box for the Volkswagen Beetle can easily be identified by the 3 black parallel lines running the circumference of the box. 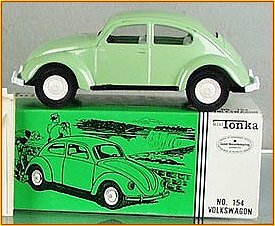 When the Volkswagen Beetle was introduced to the Mini Tonka series in 1966, each color was assigned its unique 3 digit model number. 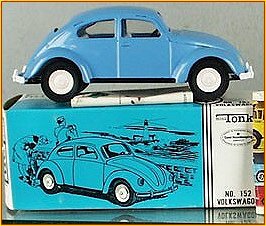 Examples would be the blue VW Bug carries model #152 and the green Bug is model #154. 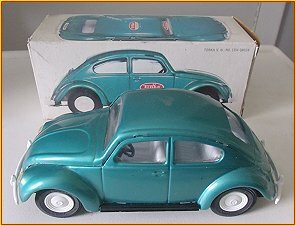 Model numbers on the 1967 Beetles carried over from 1966. 1968 is where things changed. 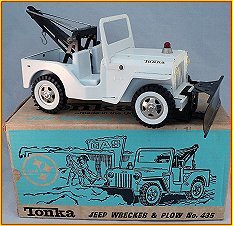 Tonka packaged 12 Bugs, in equal quantities, in a "master" and assigned model #1158 to the assortment. 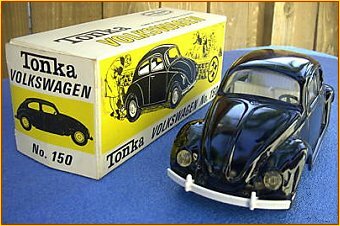 In 1968 and 1969, 4 colors of Bugs were produced. When you do the math, 3 Bugs of 4 colors made up the #1158 assortment. 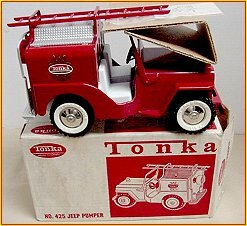 Beginning in 1970, only 2 colors were available. Still using a 12 pack "master" the #1158 assortment consisted of 6 each of 2 colors.